My life is sloooowly calming down. Last week, James finished school, Annie finishes school this week, and my current freelance job ends the week after. Softball still runs until the end of June, but I’m looking forward to not being pulled in a million directions! I’m spread verrrrrry thin right now. I’m excited for that point in the not-to-distant future where I won’t be up at 3am worrying about work or teacher evaluations or batting lineups! ~Why Doesn’t Anyone Answer the Phone Anymore? ~Are you inadvertently encouraging your colleagues to BS you? 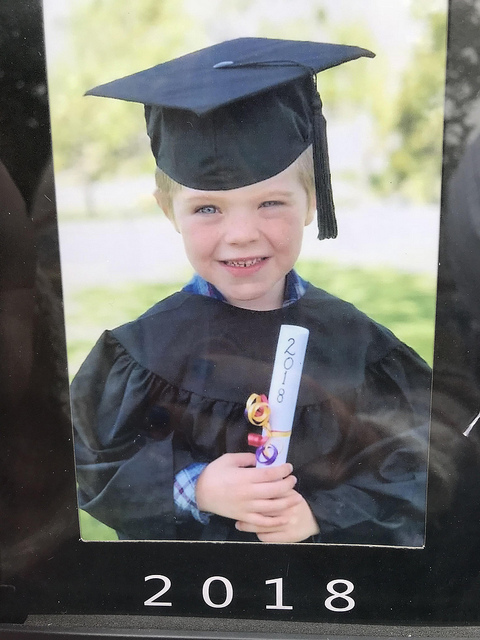 James is done with preschool, you guys. It feels like just yesterday I was putting him in silly poses while Annie was at preschool and now he’s DONE WITH IT HIMSELF. Time is ridiculous (and don’t even get me started on him turning five). I just adore the teachers he and Annie had and I’m sad to leave them, but excited to have both kids at the same school for the first time. Onward and upward (but really time, slow down already). And speaking of James turning five, he got some pretty fun stuff for his birthday. ~Both kids LOVE this “laser” game that lets them get their inner Mission Impossible on. ~My cousin Leah got him a Titanic pool float and he can’t WAIT to “make it sink.” Little weirdo. ~My friend Jen sent James these Skechers light up shoes, and he is OBSESSED.